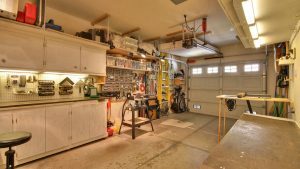 Do you spend a lot of time in your garage either working on cars or another hobby? If so, you may find times when your garage gets so hot that it’s unbearable to spend time there. Air conditioning a garage can be a challenge, but it’s not impossible. Garages typically lack insulation and ventilation and tend to have a lot of open space. Some have windows, some don’t. Some have only one door that opens on one side with the remaining 3 walls closed off. All of these characteristics make garages difficult to keep cool. But you can beat the heat with these cooling options. Affordable Garage Cooling Options (In order from least expensive to most expensive). Fans. One way to make your garage feel cooler is to install or use portable fans. Fans don’t cool the air, but they get the air moving, which can make a big difference in a hot, stuffy garage. Window unit. If you have the luxury of a window in your garage, a window air conditioner can work well. Turn it on whenever you want to be in the garage yourself, otherwise leave it off. Your car doesn’t need AC. Portable air conditioner. Since you can put it anywhere, a portable air conditioner is ideal for garages and any other space that lack AC. However, since garages lack proper insulation, a portable air conditioner may fail to cool sufficiently. If it seems that your portable AC isn’t keeping you cool, consider adding insulation to your garage. Carolina Fuels installs air conditioning units from some of the top AC brands and best manufacturers including: Lennox, York, Goodman, Armstrong Air, and Thermopride. Add up the square footage of your garage and be sure to purchase an air conditioner that is designed to cool a big enough space. Pricing is determined by the size of the area the unit can cool. Many portable AC units double as dehumidifiers, which helps your garage feel cooler by drying out the air and making it feel less stuffy. Most window units are designed to cool small rooms, so they may not be effective for a large garage space. A heavy duty window unit may be better for cooling a larger space. The higher the BTU (British Thermal Unit) rating, the bigger the space that can be cooled by the system. Be sure to purchase one that can handle the total square footage of your garage. If you have a Mother-in-law suites or a FROG (Finished Room Over Garage), it can work well to install a separate HVAC system for those two spaces. Your garage and the space above can share one set of ductwork and one air conditioning unit. You can maximize energy usage and HVAC equipment by cooling both spaces at the same time. Contact Carolina Fuels for tips on air conditioning your garage and other spaces. Call (336) 623-9741 to request a quote.